Attractive, comfortable and renowned for its resistance to weather and insects, Western red cedar has been a top choice for crafting fine furniture for outdoors use for generations. 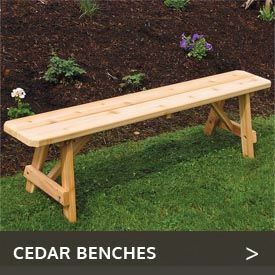 At Cedarwood Furniture, we carry a complete collection of Western red cedar wood outdoor furniture that enables you to furnish your outdoor space exactly the way you like. No matter how big or how small a space you have to work with, you will find something here that fits your space as well as your taste. Whether you plan to entertain lots of guests or just want to furnish a place outside where you and your family can enjoy nice weather, these pieces will provide you with comfort and looks for years to come. 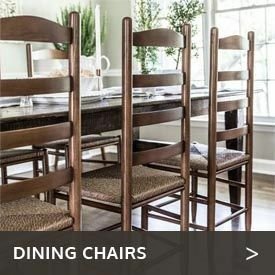 You can find all the outdoor seating you need here, from cedar chairs and benches to rockers and gliders. We’ve got you covered for cedar accent tables too, whether you are looking for a quality cedar side table to set next to your cedar chair or settee, or a cedar coffee table for holding hot or cold beverages as well as snacks. 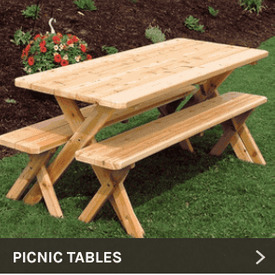 If you love to picnic in your backyard when the weather’s fine, our cedar picnic sets will provide years of use. We have them in sizes ranging from 4 feet to 8 feet, making it easy to fit any space, and with your choice of backed or backless benches, attached or unattached to the table.